Float tube fishing is simply….the way to go! If, like me….you live in an area with lots of ponds and small lakes…and you haven’t fished from a float tube…then you simply don’t know what you have been missing! First the tubes themselves are lightweight, easy to store and set up in under one minutes. I might also add that they are inexpensive; around $250 dollars with get you an entire set up and you can be fishing tomorrow. Have you ever been on vacation and wanted to fish…but didn’t have a boat or standing on the shore just didn’t cut it…a float tube is the answer. It will fold up into a small bag and be out of the way until you need the vessel or means to go fishing. I have fished out of one of these in all kinds of water and all temperatures. A couple years back I caught a 6 pound largemouth while sitting less than 30 feet from the edge of the ice. 5mm waders will get you 2 hours or more in any temperature water! If you are looking for a quiet way to slip in on fish…then look no further as a float tube is the ultimate in stealth and will allow you to go about anywhere that there is 6 inches or so of water. As you can see from the video I have landed lots of large and smallmouth bass, catfish, crappie, sunfish…and many, many trout. 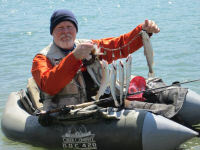 So…if you have been thinking about it….go to PortableKayaks.com and talk to Dennis, he will set you up and get you the best price possible…and in a matter of a few days you too can be hauling in a load of fish….anywhere!